Should young children own cellphones? Smartphones are everywhere and even the youngest member of the family can own one. But think twice about gifting your young child with the latest cellphone on the market. Cyberbullying starts early, and eight- and nine-year-olds with cellphones are especially vulnerable, new research finds. 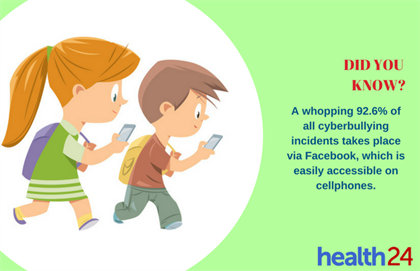 Statistics show that social media, which is easily accessible on most cellphones, is the most common medium for cyberbullying. "Parents often cite the benefits of giving their child a cellphone, but our research suggests that giving young children these devices may have unforeseen risks as well," said study researcher Elizabeth Englander, a professor of psychology at Bridgewater State University in Massachusetts. Englander and her colleagues surveyed nearly 4 600 students in third, fourth and fifth grades between 2014 and 2016. Overall, about 10% said they'd been victims of a cyberbully. However, younger students with phones were much more likely to report electronic abuse, the study showed. Cellphones also increased the students' odds of becoming cyberbullies themselves. This was true in all three grades, the study found. The researchers found that older kids were most likely to have phones – about six in 10 students. But half of fourth graders and about 40% of third graders had them as well. Having a phone gives kids more opportunity to engage positively and negatively with their peers through social media and texting, the researchers explained. This constant access ups the likelihood that students will send or receive impulsive texts or messages. The study authors cautioned parents to consider the potential downside of providing a cellphone to a child not yet in primary school. "At the very least, parents can engage in discussions and education with their child about the responsibilities inherent in owning a mobile device, and the general rules for communicating in the social sphere," Englander said in a news release from the American Academy of Pediatrics. Always be mindful of the effects of cyberbullying and act when you think your child might be a target.